The relatively straight-forward approach, beautiful setting and steep, dramatic buttress add to the appeal of this route. The North Buttress is the classic High Sierra route—loose and exposed in places. The route has some great pitches, but also some loose rock. 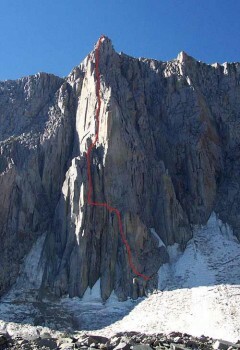 This is a good route to do after you have climbed some of the more classic 5.9s such as Fishhook Arête on Mt. Russell. You should be a very solid 5.9 leader as the crux pitch, although well-protected, is stout. Because there is a runout 5.9 face traverse, the follower as well as the leader should be aware of the potential for a nasty pendulum fall. Which SuperTopo guidebooks include a topo for North Buttress? The route as seen from the final approach to the snowfield.